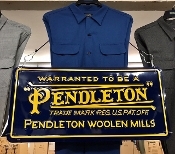 Pendleton metal l"icense plate", made for Greenspan's, in South Gate, California by Pendleton Woolen Mills, a sign with the logo from the blue label. Measures approximately 24 inches by 12 incles. Great for his man cave. Shipped separtately.